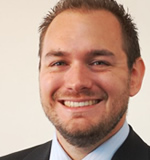 Demand for insurance can be driven by high risk aversion or high risk. We show how to separately identify risk preferences and risk types using only choices from menus of insurance plans. Our revealed preference approach does not rely on rational expectations, nor does it require access to claims data. 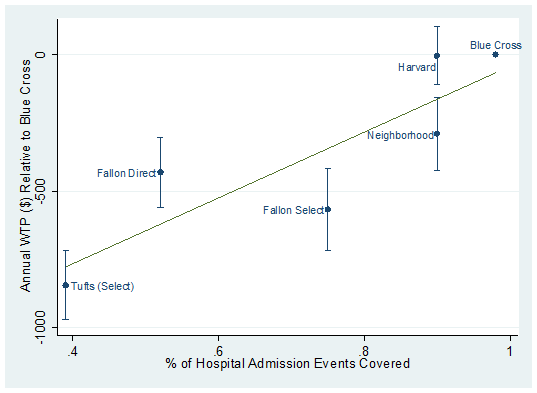 We show what can be learned non-parametrically from variation in insurance plans, offered separately to random cross-sections or offered as part of the same menu to one cross-section. We prove that our approach allows for full identification in the textbook model with binary risks and extend our results to continuous risks. We illustrate our approach using the Massachusetts Health Insurance Exchange, where choices provide informative bounds on the type distributions, especially for risks, but do not allow us to reject homogeneity in preferences. Published: American Economic Review, Papers and Proceedings, 2015. We measure provider coverage networks for plans on the Massachusetts health insurance exchange using a two measures: consumer surplus from a hospital demand system and the fraction of population hospital admissions that would be covered by the network. The two measures are highly correlated, and show a wide range of networks available to consumers. We then estimate consumer willingness-to-pay for network breadth, which varies by age. 60-year-olds value the broadest network approximately $1200-1400/year more than the narrowest network, while 30-year-olds value it about half as much. Consumers place additional value on star hospitals, and there is significant geographic heterogeneity in the value of network breadth. Abstract: I examine the interaction between present-bias and limited memory. Individuals in the model must choose when and whether to complete a task, but may forget or procrastinate. 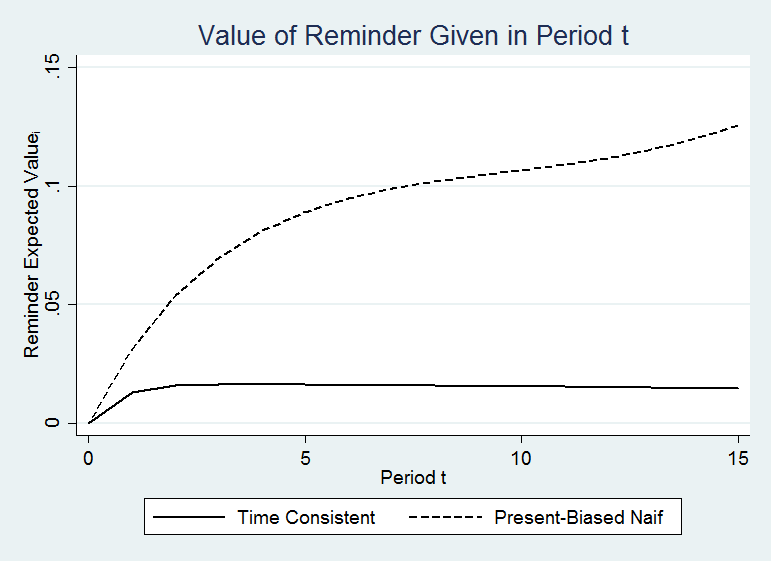 Present-bias expands the effect of memory: it induces delay and limits take-up of reminders. Cheap reminder technology can bound the cost of limited memory for time-consistent individuals but not for present-biased individuals, who procrastinate on setting up reminders. Moreover, while improving memory increases welfare for time-consistent individuals, it may harm present-biased individuals because limited memory can function as a commitment device. Thus, present-biased individuals may be better off with reminders that are unanticipated. Finally, I show how to optimally time the delivery of reminders to present-biased individuals. Abstract: Do individuals have unbiased beliefs, or are they over- or underconfident? Overconfident individuals may fail to prepare optimally for the future, and economists who infer preferences from behavior under the assumption of unbiased beliefs will make mistaken inferences. This paper documents overconfidence in a new domain, prospective memory, using an experimental design that is more robust to potential confounds than previous research. Subjects chose between smaller automatic payments and larger payments they had to remember to claim at a six-month delay. In a large sample of college and MBA students at two different universities, subjects make choices that imply a forecast of a 76% claim rate, but only 53% of subjects actually claimed the payment. Published 2011 in the Journal of the European Economic Association; Ungated working paper available at SSRN. “The Procrastination Doom Loop—and How to Break It.” The Atlantic, August 26 2014. “How to Procrastinate Better.” Bloomberg. September 4, 2014. Dynamic defaults for recurring purchases determine what happens to consumers enrolled in a product or service who take no action at a decision point. Consumers may face automatic renewal, automatic switching, or non-purchase defaults. Privately optimal dynamic defaults depend on the contributions of adjustment costs versus psychological factors leading to inaction: both produce inertia under renewal defaults, but differ under non-renewal defaults. Defaults have equilibrium effects on pricing by changing the elasticity of repeat demand. Socially optimal defaults depend on firms’ pricing responses as well; more elastic repeat demand restrains price increases on repeat customers and can reduce inefficient switching. (Latest draft here. Older: NBER Working Paper 20127). See also discussion in The Incidental Economist.